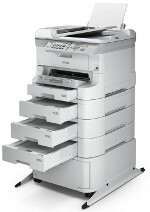 DataMaster Labs have run the test suite on the new EPSON WF-8590DWF which the manufacturer provided. A surprising machine on many fronts! The control panel is much like one from the toner MFP marketplace - and the machine can handle very high paper weights (and A3+) without any effect on productivity. The ink cartridges' capacity (up to 70,000 pages) coupled with the device's very low electrical consumption give this machine excellent environmental credentials. Check out the detailed results on Your DMO.